Stage 2 non-small cell lung cancer is defined as a “localized cancer,” that is, it refers to a tumor that is present in the lung and may have spread to local lymph nodes, but has not spread further. Tumors that have spread beyond these areas are referred to as "advanced cancers." About 30 percent of lung cancers are diagnosed when they are at stage 1 or 2, and the prognosis (long-term outcome) is significantly better than with later stages of the disease. How is it determined that a lung cancer is stage 2 (stage II), and how this stage of lung cancer is treated? Determining the stage of a lung cancer is very important in choosing the most appropriate treatment. Part of the lung has collapsed or developed pneumonitis (inflammation of the lung) in the area where the trachea joins the bronchus but does not involve the lung. Cancer has spread to the main bronchus and is at least 2 centimeters below the area where the trachea joins the bronchus. Part of the lung has collapsed (atelectasis) or developed pneumonitis (inflammation of the lung) in the area where the trachea joins the bronchus. Cancer has spread to the main bronchus (and is less than 2 centimeters closer to the site where the trachea joins the bronchus but does not involve the junction area), the chest wall, the diaphragm, or the nerve that controls the diaphragm. Cancer has spread to the membrane around the heart (pericardium) or lining the chest wall. 2A – T1A/1BN1M0 – Meaning the tumor is less than 3 cm (1 ½ inches) in size, and it has spread to nearby lymph nodes. 2A – T2AN1M0 – The tumor is larger than 3 cm, but less than 5 cm, in size, or cancer has spread to the main bronchus and is at least 2 cm below the carina, or cancer has spread to the lining of the lung, and it has spread to nearby lymph nodes. 2B – T2N1M0 – The tumor is greater than 3 cm, but less than 7 cm, in size, and it has spread to local lymph nodes. 2B –T3N0M0 – The tumor is greater than 7 cm in size and has not spread to lymph nodes, but is in the airway or has spread to local areas such as the chest wall or diaphragm. One of the recent advances in lung cancer treatment has been the ability to treat some of these cancers by "targeting" mutations in the tumor. Along with characterizing a tumor based on size and how far it has spread, oncologists are now using genetic testing (molecular profiling) for lung cancer to further "personalize" the diagnosis. Until recently, testing was reserved primarily for people with more advanced stages of the disease, but with advances in treatment, it's likely that those with stage 2 disease, especially people with lung adenocarcinoma, this testing will become routine. The most common symptoms of stage 2 lung cancer are a persistent cough, coughing up blood (hemoptysis), shortness of breath, pain in the chest or back, or repeated infections such as pneumonia or bronchitis. Since stage 2 lung cancer has not metastasized (spread) beyond the lungs, symptoms such as unintentional weight loss and fatigue are less common than in more advanced stages. It's important to note that the symptoms of lung cancer in women (and in non-smokers) may differ from the symptoms in men (or in those who have smoked). This is important as lung cancer is almost as common now in women as in men. And though many people associate lung cancer with smoking, the incidence of lung cancer in one group, in particular, is significantly increasing: young, never-smoking women. Surgery is the treatment of choice for stage 2 lung cancer, offers the greatest chance of a cure at this stage of the disease. There are 3 main types of lung cancer surgery that are done for lung cancer, and choosing which procedure is best depends on where your tumor is located and your general state of health. In recent years a less invasive form of surgery called video-assisted thoracoscopic surgery (VATS) has become available. With this technique, a part of the lung may be removed through small incisions in the chest wall. It can be wise to consider a second opinion when deciding upon lung cancer surgery. Studies suggest that people who have these procedures done at hospitals that do a large volume of these surgeries have better outcomes. Most oncologists recommend adjuvant chemotherapy (chemotherapy after surgery) for those who undergo surgery for stage 2 lung cancer. The concept with this type of chemotherapy is to "clean up" any cancer cells that may have spread beyond the lungs (metastasized) but are not yet visible on any imaging tests. Depending on the location of your tumor, some oncologists may instead neoadjuvant chemotherapy—chemotherapy given before surgery to decrease the size of a tumor and make removing the tumor easier. Radiation therapy is not often used with stage 2 lung cancer but is an option for those who are unable to have surgery due to where the tumor is or general health concerns (inoperable lung cancer). In this setting, radiation can sometimes result in a cure. Other techniques such as proton beam therapy are being evaluated for stage 2 disease. At the current time, targeted therapies and immunotherapy are primarily used for people with stage 4 lung cancer, but this may be changing. In 2018 the use of immunotherapy was extended for some people with stage 3 lung cancer, and clinical trials are in progress looking to see whether using immunotherapy prior to surgery may improve survival rates and reduce the risk of recurrence. According to the National Cancer Institute, people with lung cancer should consider participating in clinical trials. Many advances in treating lung cancer have been made, and during the period between 2011 and 2015, there were more new medications approved for lung cancer than in the 40-year period prior to 2011. Many clinical trials are in progress for stage 2 lung cancer looking at less invasive surgical methods, new radiation methods, and new treatments such as targeted therapies and immunotherapy for this stage of the disease. The overall lung cancer recurrence rate (either locally or in other regions of the body) for localized lung cancer (stage 1 and stage 2) is between 20 and 50 percent. 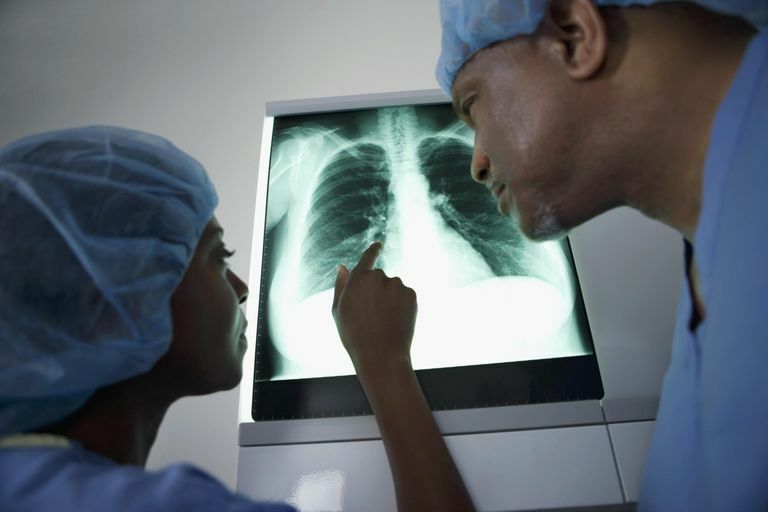 If a lung cancer recurs, further options are available for treatment. These may include radiation with or without chemotherapy or one of the new targeted therapies or immunotherapy medications that are being evaluated in many clinical trials. In the past, a distant recurrence, and subsequent diagnosis of stage 4 lung cancer, often meant an average survival of a year or less. This is changing, and there are now many people living for years with stage 4 lung cancer due to advances. To give this some perspective, there are now 4 immunotherapy drugs available for advanced lung cancer, and for some people, these drugs have resulted in a "durable response" or long-term survival. The first drug in this category was only approved for use by the public in 2015, and clinical trials are looking at further options, such as combining these drugs. The overall 5-year survival rate is approximately 30 percent for stage 2 non-small cell lung cancer. In individual situations, this number may sometimes vary, depending upon your particular tumor and your general health. Keep in mind that statistics about survival are often several years old, and new treatments that have been approved may not have been available when those numbers were recorded. Studies suggest that learning about your disease can improve your outcome. Ask questions. Learn about clinical trials that might be appropriate for you. If you are newly diagnosed with lung cancer, take a moment to breathe and think carefully about your current situation. Most decisions with lung cancer are not urgent, and you can often take a little time to fully evaluate your next steps. In some ways, you may feel like you just lost control of your life, but there are some things you can do yourself that even improve survival with lung cancer. Living with cancer can take a village. Allow people to help you. This isn't a time to be the "strong one," and cancer can be exhausting even with help. If it is your loved one who has been diagnosed with cancer, check out this article, "When your loved one has lung cancer." Even if you have the loving support of family and friends, living with cancer can still be a lonely experience. Look into support groups in your community as well as online. There is a wonderful lung cancer community online where many people with lung cancer find support, while at the same time learning about the latest progress in lung cancer. Reckamp, K. and Reckamp. (2016). Lung Cancer. Springer.